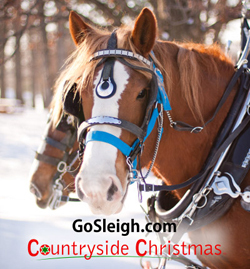 Enjoy our Magical Winter Wonderland as you take a sleigh ride in our Luxurious Old-Fashioned Sleighs pulled by our beautiful Belgian draft horses. The fallen snow and light displays transform our scenic landscape into a nostalgic and thrilling experience. Our breathtaking trail follows the beautiful terrain surrounding a small lake, stream, and mature trees. Snuggled under a warm blanket with festive music playing in the background you are ready to create memories you will cherish forever. Our friendly and hospitable service, combined with warm hot beverages, and other treats, add to the delightful atmosphere. Join GoSleigh this Winter for unforgettable fun and fond memories!